Today the spotlight is on Damalis Garcia. 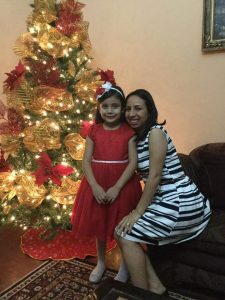 Though she has only been with Olancho Aid for just over a year, she has shown tremendous leadership within the Foundation. In her role, she seeks and manages talent, but she also does a lot more. Damalis works to support every person in the Foundation, whether it be through her amazing problem-solving abilities or through a kind word. Read on to learn more about Damalis and her work! University: José Cecilio del Valle, Tegucigalpa M.D.C. Many years ago, when I was in my previous job, the son and daughters of my co-workers were very interested in being a part of CEBSC. I heard good comments about the quality of education the school was giving to the community, including religious education. Then some friends told me that they were hiring at Olancho Aid to work at main office. I prayed to God to guide me if this was a place that he wanted me to serve other people with my work so I applied and had several interviews with the Executive Director and with the President of the Board and here I am being part of this great family. I’m the Director of Human Talent. My favorite part of what I do is that every day is totally different. Since my first day here, I’ve had never had a monotonous day, so I consider every day an adventure. I also enjoy solving different situations (good and bad) for all of our staff. Favorite memories… several (it’s difficult to think of just one) especially with my co-workers at the main office when we work all together to prepare some event for the rest of the projects. At the end when we finish and evaluate ourselves and how we did it, we see that we are a good team together. We are a family. Also doing sport activities with the office, especially Zumba every once in a while. Even though I’m graduated with different degree, I’m in love with what I do every day. I’m also starting to introduce my knowledge of what I was graduated in to all the projects of OAF, and that makes me proud of my work every day.